On the 19th of March, the Solemnity of St. Joseph, in the Year of the Great Jubilee of Mercy, His Holiness Pope Francis signed the much awaited Post-Synodal Apostolic Exhortation, Amoris Laetitia, the Joy of Love, covering the two Synods, Ordinary and Extraordinary on the Family. Thus, at the start of His 4th Anniversary of Pontificate the Holy Father has given us the third great and important document in line with his chosen Mission of Proclaiming the Gospel and witnessing to the same personally in such a powerful manner .Both the earlier documents, the beautiful Exhortation, Evangelii Gaudium, and the Social encyclical on Caring for Creation ,Laudato Si, have been so much appreciated, within the Church and outside. The Holy Father, seeing the sad situation of the Family, in many parts of the world, has been turning his constant attention to the care of the Family and to the welcoming of wounded families in particular. On the eve of the third anniversary of the Conclave that elected him, Pope Francis acknowledged emphatically that” so many women and men, endure heavy and arduous burdens so as not to destroy the family, by being faithful in sickness and in health, and in hardship to a life of serenity that is fidelity. ”The Document starts with a powerful statement, namely that “the Joy of Love experienced by families is also the Joy of the Church” .The Exhortation comprises nine Chapters and is perhaps the largest Post Synodal Apostolic Exhortation with 261 pages including the INDEX. Chapter Six in particular, which spells out “Some Pastoral Perspectives” ,will be very useful for us ,namely those of us, who are entrusted with the task of Shepherding the Family in these challenging times. The Biblical and Theological reflections, in the preceding Chapters, as well as the Chapter on “Experiences and Challenges of Families” ,provide a very rich background for our Apostolate of the Family. We shall make available to all of you copies of the Papal Exhortation as soon as they are made available. In the meantime we can serialize the Chapters in our Monthly Newsletter. 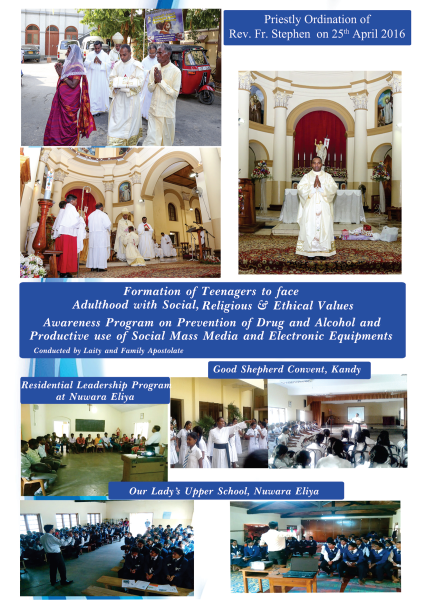 In the coming Months we shall take up for study and discussion, the Apostolic Exhortation in view of drawing up a detailed Pastoral Plan for the care of the Family in consultation with our Family Apostolate lay leaders. We are happy to welcome our brother, the newly ordained, Fr. Devadas Stephen, in to our Presbyterium. We wish him a life-long and fruitful priestly life and ministry in our diocese. Each Priest is a gift to the local Church and our faithful too, rejoice at every ordination to the Priesthood as they feel that they will not lack adequate pastoral care. It is therefore, a challenge to the newly ordained to be dedicated and faithful to his sublime calling. 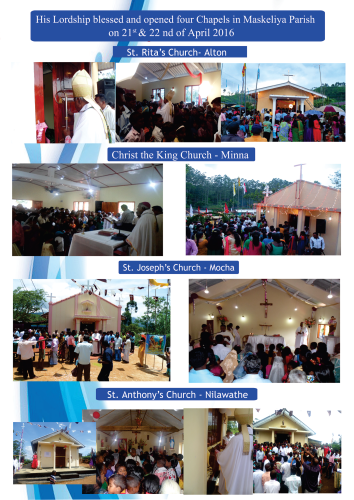 On the 21st and 22nd of April I had the joy of blessing four chapels in far flung mission areas of the Parish of Maskeliya, at Nilawatte,Minna,Mocha and Alton. Following the steps of His predecessor ,Fr.Edwin Rodrigo,Fr.Clement Jesudasan has built these chapels with the cooperation of his parishioners in these difficult areas. Needless to say the joy that abounded on these happy occasions on the faces of our beloved faithful, including children, youth and adults, and even their Hindu neighbors was, truly heart-warming, and for the Chief Shepherd of the diocese, it was a source of great joy and consolation, despite the fatigue of having to bless two chapels each day and celebrate Holy Mass in two distant places, morning and evening, with very bad roads or no road at all in some stretches .Fr.Jesudasan tells me that I would have to return to Maskeliya to bless one more Chapel ,which is nearing completion. 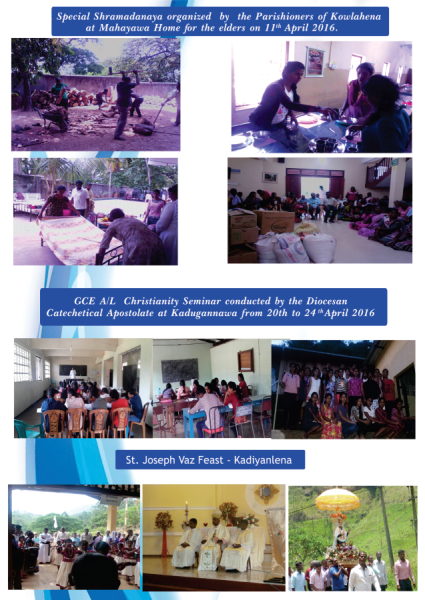 Well done, Fr.Jesudasan!! I will be away in Hua Hin,Thailand from 16th to 20th May to attend the Seminar jointly organized by the Office of Clergy and the Office of Laity and the Family of FABC. By the way my term ended as Chairman, Office of Clergy on the 31st of December. However ,as I had initiated and helped to organize this important seminar on “Shepherding the Family”, the new Chairman, Bishop Mylo Vergara and the Executive Secretary, Fr.Philip Lazatin sdb, insisted on my accepting their invitation to attend the Seminar. 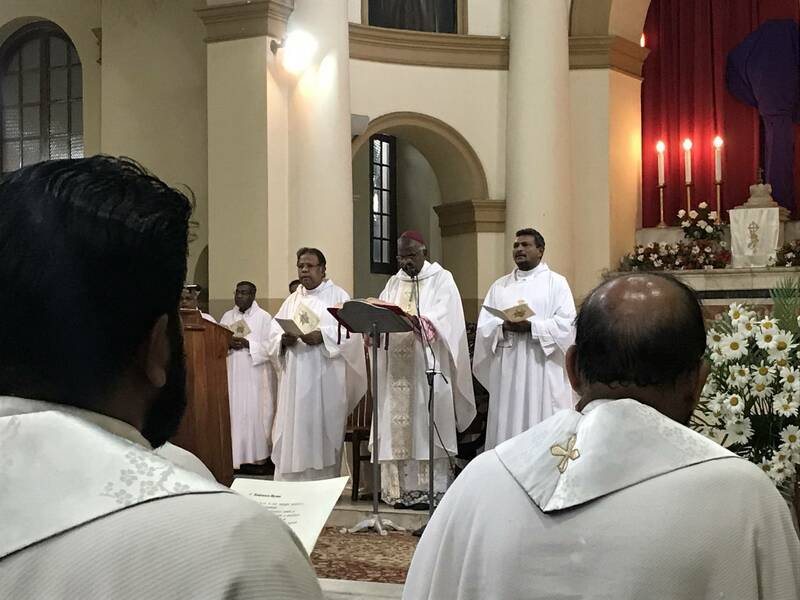 In my absence the Vicar General, Fr.Milroy Fonseka, will administer the Diocese.  Rev. Fr. Anton Gavasker -Asst. Parish Priest, St. Rita‟s Church, Nany Oya, Deputy to the Rector of Our Lady‟s Upper School Fr. Shiwantha Rodrigo ,(with residence at St. Anthony‟s Church,Blackpool, Nuwara Eliya.  Rev. Fr. 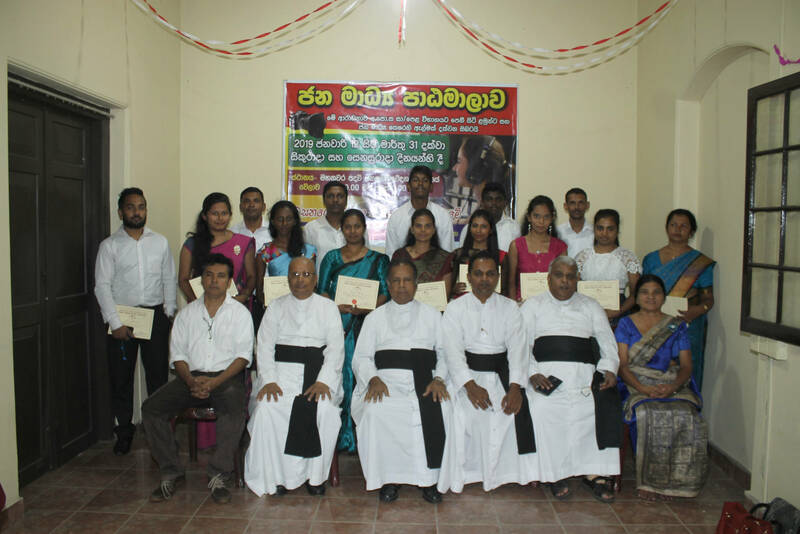 Arokiyasami Savariyar OCD -Asst. Parish Priest, Holy Cross Church, Hatton.  Rev.Fr. John Stephen -Asst. parish Priest, St. Patrick‟s Church, Talawakele. The month of May (Overview – Calendar) is the “month which the piety of the faithful has especially dedicated to Our Blessed Lady,” and it is the occasion for a “moving tribute of faith and love which Catholics in every part of the world [pay] to the Queen of Heaven. During this month Christians, both in church and in the privacy of the home, offer up to Mary from their hearts an especially fervent and loving homage of prayer and veneration. In this month, too, the benefits of God’s mercy come down to us from her throne in greater abundance” (Paul VI: Encyclical on the Month of May, no. 1).This Christian custom of dedicating the month of May to the Blessed Virgin arose at the end of the 13th century. In this way, the Church was able to Christianize the secular feasts which were wont to take place at that time. In the 16th century, books appeared and fostered this devotion. The practice became especially popular among the members of the Jesuit Order — by 1700 it took hold among their students at the Roman College and a bit later it was publicly practiced in the Gesu Church in Rome. From there it spread to the whole Church. The practice was granted a partial indulgence by Pius VII in 1815 and a plenary indulgence by Pius IX in 1859. With the complete revision of indulgences in 1966 and the decreased emphasis on specific indulgences, it no longer carries an indulgence; however it certainly falls within the category of the First General Grant of Indulgences. (A partial indulgence is granted to the faithful who, in the performance of their duties and in bearing the trials of life, raise their mind with humble confidence to God, adding — even if only mentally — some pious invocation. Wherever there is faith there is the example of Mary, because she lived by faith as the Scriptures remind us…. If, then, piety is the virtue which binds us to the sources of all life, to God, to our parents, to the Church, to Christ, certainly Christian piety binds us, in grateful love, to Mary — or our acceptance of Christ and of the mystery of our kinship with Him is imperfect, partial, and unfulfilled. In our observance of the Marian month we should take into account the season of the Liturgical Year which largely corresponds with the fifty days of Easter. Our pious exercises could emphasize Our Lady’s participation in the Paschal mystery and in Pentecost with which the Church begins. The pious exercises connected with the month of May can easily highlight the earthly role played by the glorified Queen of Heaven, here and now, in the celebration of the Sacraments of Baptism, Confirmation and Holy Eucharist. The following practices which are recommended by the Magisterium are offered as suggestions for honouring Our Lady during Her month. The Regina Coeli The ecclesial community addresses this antiphon to Mary for the Resurrection of her Son. It adverts to, and depends on, the invitation to joy addressed by Gabriel to the Lord’s humble servant who was called to become the Mother of the saving Messiah. Litanies of the Blessed Virgin Mary These consist of a long series of invocations to Our Lady, which follow in a uniform rhythm, thereby creating a stream of prayer characterized by insistent praise and supplication. Consecration and Entrustment to Mary The Roman Pontiffs have frequently expressed appreciation for the pious practice of “consecration to the Blessed Virgin Mary” and the formulas publicly used by them are well known. The Brown Scapular and other Scapulars The scapular is an external sign of the filial relationship established between the Blessed Virgin Mary, Mother and Queen of Mount Carmel, and the faithful who entrust themselves totally to her protection, who have recourse to her maternal intercession, who are mindful of the primacy of the spiritual life and the need for prayer. Medals These are witnesses of faith and a sign of veneration of the Holy Mother of God, as well as of trust in her maternal protection. The “Akathistos” Hymn In the Byzantine tradition, one of the oldest and most revered expressions of Marian devotion is the hymn of the “Akathistos” — meaning the hymn sung while standing. It is a literary and theological masterpiece, encapsulating in the form of a prayer, the universally held Marian belief of the primitive Church. Feast of St. Joseph the Worker (1st May 2016) Apparently in response to the “May Day” celebrations for workers sponsored by Communists, Pius XII instituted the feast of St. Joseph the Worker in 1955. But the relationship between Joseph and the cause of workers has a much longer history. In a constantly necessary effort to keep Jesus from being removed from ordinary human life, the Church has from the beginning proudly emphasized that Jesus was a carpenter, obviously trained by Joseph in both the satisfactions and the drudgery of that vocation. Humanity is like God not only in thinking and loving, but also in creating. Whether we make a table or a cathedral, we are called to bear fruit with our hands and mind, ultimately for the building up of the Body of Christ. “The Lord God then took the man and settled him in the garden of Eden, to cultivate and care for it” (Genesis 2:15). The Father created all and asked humanity to continue the work of creation. We find our dignity in our work, in raising a family, in participating in the life of the Father‟s creation. Joseph the Worker was able to help participate in the deepest mystery of creation. Pius XII emphasized this when he said, “The spirit flows to you and to all men from the heart of the God-man, Savior of the world, but certainly, no worker was ever more completely and profoundly penetrated by it than the foster father of Jesus, who lived with Him in closest intimacy and community of family life and work. Thus, if you wish to be close to Christ, we again today repeat, „Go to Joseph‟” (see Genesis 41:44). James, Son of Alphaeus: We know nothing of this man except his name, and of course the fact that Jesus chose him to be one of the 12 pillars of the New Israel, his Church. He is not the James of Acts, son of Clopas, “brother” of Jesus and later bishop of Jerusalem and the traditional author of the Letter of James. James, son of Alphaeus, is also known as James the Lesser to avoid confusing him with James the son of Zebedee, also an apostle and known as James the Greater. Like the other apostles, Philip took a long time coming to realize who Jesus was. On one occasion, when Jesus saw the great multitude following him and wanted to give them food, he asked Philip where they should buy bread for the people to eat. St. John comments, “[Jesus] said this to test him, because he himself knew what he was going to do” (John 6:6). Philip answered, “Two hundred days‟ wages worth of food would not be enough for each of them to have a little [bit]” (John 6:7). John‟s story is not a put-down of Philip. It was simply necessary for these men who were to be the foundation stones of the Church to see the clear distinction between humanity‟s total helplessness apart from God and the human ability to be a bearer of divine power by God‟s gift. Ascension Day is held on a Thursday 39 days after Easter Sunday. The day commemorates Jesus Christ‟s ascension into heaven. This day known as Ascension Thursday or Holy Thursday or more popular referred to as Ascension Day commemorates the ascension of Jesus into heaven on the fortieth day of Easter celebrated by a feast. 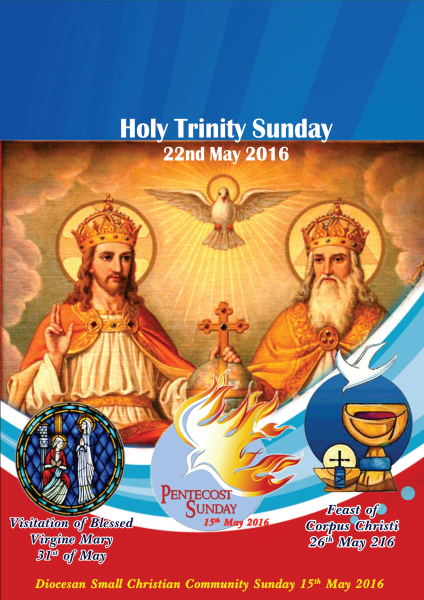 The end of Easter season is marked by Ascension Day and its ten days before Pentecost. In the Catholic Church the day if referred to as The Ascension of the Lord. This day is not a national holiday but rather an observance nationally recognized by Christians. Prior to the 5th century very little information exists about the observance of the feast but St Augustine says it is of apostolic origin and that it was a common observance in the church. Various other Saints have writings referring to the feast including St John Chrysostom and St Gregory of Nyssa. the brothers (about 120 of Jesus‟ followers). Now that Judas had betrayed his ministry, it was necessary, Peter said, to fulfil the scriptural recommendation that another should take his office. “Therefore, it is necessary that one of the men who accompanied us the whole time the Lord Jesus came and went among us, beginning from the baptism of John until the day on which he was taken up from us, become with us a witness to his resurrection” (Acts 1:21-22). They nominated two men: Joseph Barsabbas and Matthias. They prayed and drew lots. The choice fell upon Matthias, who was added to the Eleven. Matthias is not mentioned by name anywhere else in the New Testament. What was the holiness of Matthias? Obviously he was suited for apostleship by the experience of being with Jesus from his baptism to his ascension. He must also have been suited personally, or he would not have been nominated for so great a responsibility. Must we not remind ourselves that the fundamental holiness of Matthias was his receiving gladly the relationship with the Father offered him by Jesus and completed by the Holy Spirit? If the apostles are the foundations of our faith by their witness, they must also be reminders, if only implicitly, that holiness is entirely a matter of God‟s giving, and it is offered to all, in the everyday circumstances of life. We receive, and even for this God supplies the power of freedom. As Fr. John Hardon points out in his Modern Catholic Dictionary, the origins of the celebration of Trinity Sunday go all the way back to the Arian heresy of the fourth century. Arius believed that Christ was a created being, and in denying the divinity of Christ, he denied that there are three Persons in God. Arius’ chief opponent, Athanasius, upheld the orthodox doctrine that there are three Persons in one God, and the orthodox view prevailed at the Council of Nicaea, from which we get the Nicene Creed, recited in most Christian churches every Sunday. (The Council of Nicaea also gives us a wonderful example of how a real bishop deals with a heretic; see my biography of Saint Nicholas of Myra for the whole story. )To stress the doctrine of the Trinity, other Fathers of the Church, such as St. Ephrem the Syrian, composed prayers and hymns that were recited in the Church’s liturgies and on Sundays as part of the Divine Office, the official prayer of the Church. Eventually, a special version of this office began to be celebrated on the Sunday after Pentecost, and the Church in England, at the request of St. Thomas à Becket (1118-1170), was granted permission to celebrate Trinity Sunday. The celebration of Trinity Sunday was made universal by Pope John XXII (1316-34).For many centuries, the Athanasian Creed, traditionally ascribed to Saint Athanasius, was recited at Mass on Trinity Sunday. While seldom read today, this beautiful and theologically rich exposition of the doctrine of the Holy Trinity can be read privately or recited with your family to revive this ancient tradition. thirteenth century and was extended to the whole Church by Pope Urban IV in 1264. This feast is celebrated on the Thursday following the Trinity Sunday or, as in the USA, on the Sunday following that feast. This feast calls us to focus on two manifestations of the Body of Christ, the Holy Eucharist and the Church. The primary purpose of this feast is to focus our attention on the Eucharist. The opening prayer at Mass calls our attention to Jesus’ suffering and death and our worship of Him, especially in the Eucharist. At every Mass our attention is called to the Eucharist and the Real Presence of Christ in it. The secondary focus of this feast is upon the Body of Christ as it is present in the Church. The Church is called the Body of Christ because of the intimate communion which Jesus shares with his disciples. He expresses this in the gospels by using the metaphor of a body in which He is the head. This image helps keep in focus both the unity and the diversity of the Church.The Feast of Corpus Christi is commonly used as an opportunity for public Eucharistic processions, which serves as a sign of common faith and adoration. Our worship of Jesus in His Body and Blood calls us to offer to God our Father a pledge of undivided love and an offering of ourselves to the service of others. Feast of Visitation of the Blessed Virgin Mary (31st May 2016) This is a fairly late feast, going back only to the 13th or 14th century. It was established widely throughout the Church to pray for unity. The present date of celebration was set in 1969 in order to follow the Annunciation of the Lord (March 25) and precede the Nativity of John the Baptist (June 24). Like most feasts of Mary, it is closely connected with Jesus and his saving work. The more visible actors in the visitation drama (see Luke 1:39-45) are Mary and Elizabeth. However, Jesus and John the Baptist steal the scene in a hidden way. Jesus makes John leap with joy—the joy of messianic salvation. Elizabeth, in turn, is filled with the Holy Spirit and addresses words of praise to Mary—words that echo down through the ages. It is helpful to recall that we do not have a journalist‟s account of this meeting. Rather, Luke, speaking for the Church, gives a prayerful poet‟s rendition of the scene. Elizabeth‟s praise of Mary as “the mother of my Lord” can be viewed as the earliest Church‟s devotion to Mary. As with all authentic devotion to Mary, Elizabeth‟s (the Church‟s) words first praise God for what God has done to Mary. Only secondly does she praise Mary for trusting God‟s words. Then comes the Magnificat (Luke 1:46-55). Here Mary herself (like the Church) traces all her greatness to God. One of the invocations in Mary‟s litany is “Ark of the Covenant.” Like the Ark of the Covenant of old, Mary brings God‟s presence into the lives of other people. As David danced before the Ark, John the Baptist leaps for joy. As the Ark helped to unite the 12 tribes of Israel by being placed in David‟s capital, so Mary has the power to unite all Christians in her Son. At times, devotion to Mary may have occasioned some divisiveness, but we can hope that authentic devotion will lead all to Christ and therefore to one another. Holy Mary Paying Tribute to Mary the Mother of Jesus and Mother of all Christians. May is the month when Catholics traditionally focus on Mary, the Mother of Jesus. The month of May, a month which the piety of the faithful has long dedicated to Mary, the Mother of God. Our heart rejoices at the thought of the moving tribute of faith and love which will soon be paid to the Queen of Heaven in every corner of the earth. For this is the month during which Christians, in their churches and their homes, offer the Virgin Mother more fervent and loving acts of homage and veneration; and it is the month in which a greater abundance of God’s merciful gifts comes down to us from our Mother’s throne.This practice is echoed on a smaller scale throughout the Catholic world with families decorating a statue or picture of the Virgin Mary in their own homes. When we call Mary “our mother,” we grasp instinctively the essential meaning of the title, since it evokes memories of a human experience that is universal and runs deep. But when it comes to explaining clearly and precisely the content of the title, the matter is not so simple. ùùùùùùùùùùùùùùùùùùùùùùùùùùùùùùùùùùùùùùùùùùùùùùùùùùùùù Woman shows incredible mercy as her son’s killer moves in next door A mother whose only child was shot dead has shown the ultimate forgiveness – by inviting her son’s killer to live next door. Mary Johnson, 59, now lives in the apartment adjoining the home of 34-year-old Oshea Israel and they share a porch. In February 1993, Mrs Johnson’s son, Laramiun Byrd, 20, was shot in the head by 16-year-old Israel after an argument at a party in Minneapolis, Minnesota. Israel, who was involved with drugs and gangs, was tried as an adult and sentenced to 25 and a half years. He served 17 before being released. He now lives back in the neighbourhood where he grew up – next door to the mother of the young man he murdered. Mrs Johnson said she originally wanted justice and to see Israel locked up for what he had done. She said: ‘My son was gone. I was angry and hated this boy, hated his mother. ‘[The murder] was like a tsunami. Shock. Disbelief. Hatred. Anger. Hatred. Blame. Hatred. I wanted him to be caged up like the animal he was. „She decided to found a support group and counselled mothers whose children had been killed and encouraged them to reach out to the families of their murderers, who were victims of another kind. ‘Hurt is hurt, it doesn’t matter what side you are on,’ she said. Mrs Johnson and Israel are now close friends, a situation that she puts down to her strong religious beliefs but says she also has a selfish motive. She said: ‘Unforgiveness is like cancer. It will eat you from the inside out. „It‟s not about that other person, me forgiving him does not diminish what he’s done. Yes, he murdered my son – but the forgiveness is for me.’Mary Johnson even wears a necklace with a two-sided locket – on one side are photos of herself and her son; the other has a picture of Israel. Israel admits he still struggles with the extraordinary situation he finds himself in. He said: ‘I haven’t totally forgiven myself yet, I’m learning to forgive myself. And I’m still growing toward trying to forgive myself. „Israel now hopes to prove himself to the mother of the man he killed. He works at a recycling plant during the day and goes to college at night. He says he’s determined to payback Mrs Johnson’s clemency by contributing to society. He visits prisons and churches to talk about forgiveness and reconciliation. Mrs Johnson often joins him and they tell their story together. It is not just commemorating the event, but also learning lessons in failures. It is not just having joy with the applause, but also having joy in anonymity. Being happy is not inevitable fate, but a victory for those who can travel towards it with your own being. Being happy is to stop being a victim of problems but become an actor in history itself. Being happy is not being afraid of one’s feelings. It is to know how to talk about ourselves. It is to bear with courage when hearing a “no”. It is to have the security to receive criticism, even if it is unfair. It is to kiss the children, pamper the parents, have poetic moments with friends, even if they have hurt us. So that your life becomes a garden full of opportunities for being happy… In your spring-time, may you become a lover of joy. In your winter, may you become a friend of wisdom. O Cross of Christ, today too we see you in the foolish who build warehouses to store up treasures that perish, leaving Lazarus to die of hunger at their doorsteps. O Cross of Christ, today too we see you in the destroyers of our “common home”, who by their selfishness ruin the future of coming generations. O Cross of Christ, teach us that the rising of the sun is more powerful than the darkness of night. O Cross of Christ, teach us that the apparent victory of evil vanishes before the empty tomb and before the certainty of the Resurrection and the love of God which nothing can defeat, obscure or weaken. Amen. The Vatican has published Pope Francis‟ eagerly-awaited Apostolic Exhortation on the family, drawing together almost three years of consultations with Catholics in countries around the world. The lengthy document, entitled „Amoris Laetitia‟, or The Joy of Love, affirms the Church‟s teaching that stable families are the building blocks of a healthy society and a place where children learn to love, respect and interact with others .At the same time the text warns against idealizing the many challenges facing family life, urging Catholics to care for, rather than condemning, all those whose lives do not reflect the teaching of the Church. In particular the document focuses on the need for “personal and pastoral discernment‟” for individuals, recognizing that “neither the Synod, nor this Exhortation could be expected to provide a new set of general rules, canonical in nature and applicable to all cases”.